Odds are, if you’ve been designing websites for a few years or more you’ve either partnered with a developer on a project or considered it. After all, as our businesses grow it becomes more important to focus on the tasks we really love and less on the tasks that just get in the way. One way you can free up large chunks of time to focus more on design is to outsource your development. It’s the perfect way to avoid the tech headaches and make your web design projects go more smoothly. However, getting the hang of collaborating with a developer takes a little practice and a whole lot of knowledge. 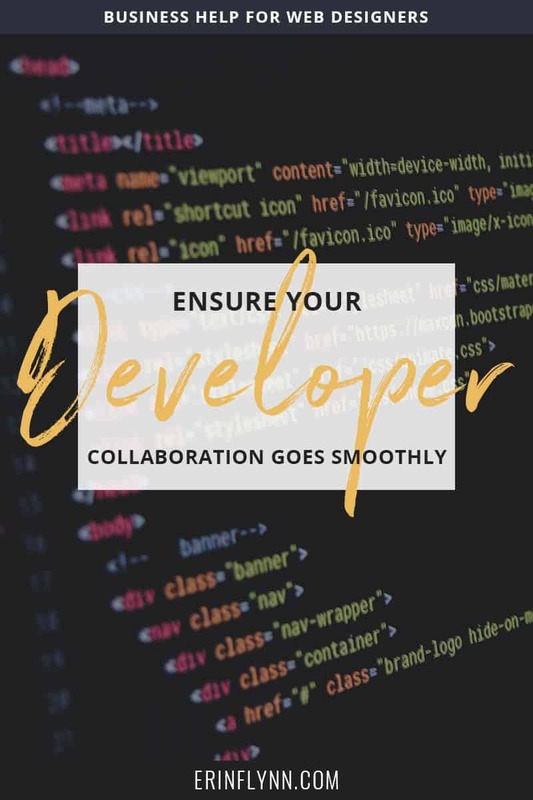 So today, we’ll go over 4 ways to ensure your developer collaboration goes smoothly. Being clear with your expectations before a project begins is an important part of having a successful collaboration. Response time – How quickly do you expect your developer to respond to questions? How quickly will you respond to theirs? For the designers I collaborate with frequently, I like to have them join my team’s Slack group so we can send quick messages back and forth when needed. Client communication – Who will communicate with the client during different phases of the project? Will your developer be copied onto all the emails? Will they go through you if they run into questions during development or communicate with the client themselves? Training and maintenance – Who is responsible for providing training and maintaining the site after the launch? Do you provide your own support period and maintenance package or is that something you’d prefer your developer take care of? Progress updates – How frequently do you expect progress updates? I tend to give the designers I work with access to my staging sites as well as provide updates each Friday. If you’re the type of person that likes to know what’s going on at all times, maybe asking for daily updates would feel better to you. These are just a few examples, but both parties should have a solid understanding of the expectations of the other. Each project will be a learning experience, so I recommend taking notes of new expectations you want set in the future as you make your way through each project. Materials being delivered on time and in the correct format can decide whether or not a project is completed by the due date. The way your mockups are delivered will play a huge role in how closely the finished website matches what you envisioned. I’ve received everything from colorless wireframes to full mockups that look exactly like the final version of the website. I’ve received those mockups in Photoshop, Illustrator, InDesign, and as PNGs. Some without a single label and some with so many labels and groupings that I didn’t know where to begin. First things first. Your developer focuses on code because they don’t know design. Sending them a wireframe and notes on your vision is likely to make their eyes go wide in fear. The mockups you send should be 100% complete and show things like heading styles and hover effects. What you send is exactly what the final version of the website is going to look like. Next, the program your mockups are created in will play a part in how easy it is for your developer to get precise measurements and navigate the files. My personal favorite program to work with is Photoshop, but Illustrator isn’t bad either. InDesign, on the other hand, has not been nearly as easy to work with from a development perspective. Make sure your developer is comfortable with whichever program you choose to create your mockups in. And last, if you don’t require client content for the design phase, it’s vital that everything from text content to images is ready by the time your developer begins work. Especially if your layouts depend on the amount of text or contents of an image. I’ve had to recode portions of a website because an image had the client’s face where text was currently sitting. If your developer’s contract is solid, it’s likely that extra time will come out of your or your clients pocket and leave everyone feeling a little less than great at the end. To make things go as smoothly as possible, get on the phone with your developer before each project and set expectations around content. I like to send the designers I work with complete checklists for themselves and the client, but if your developer doesn’t offer that, it may be something you want to create for yourself based on what you learn the first time around. Any designer or developer who has done a collaboration before will tell you that communication can make or break a project. This communication comes in a few different forms. I can’t say it better than Natalia said in Erin’s post of tips for developer collaborations. On top of what Natalia had to say, be sure every important piece of information is transferred to your developer if they’re not looped into all of your client communication. In the past, I’ve been left out of discussions about email marketing tools that were being used, start dates being delayed, and more. To make it easy, get into a Slack channel with your developer and keep a running list of notes as you communicate back and forth with your client. And last, to have a smooth and successful developer collaboration, it’s important that you understand how websites work. Even a basic understanding will ensure that your design translates to web without performance or display issues down the road. An example of an issue related to this point is a mockup I once received with three sliders on one page. To make it better, the way those sliders were laid out required two different slider plugins. If you’re familiar with performance and load speed of websites, you know that sliders in general are a big no-no. If something you’ve got in mind for your design is outside of what you see on a typical website, check with your developer before assuming it’s feasible or was included in the quote. To make it easy on both of you, you may even want to schedule a few check-in calls throughout the design process to make sure everything looks good. You probably noticed that communication was a large part in each of the above steps. Remember, everyone wants the project to be a success and won’t mind answering an extra question (or ten). Keeping everyone updated and on the same page throughout the project will ensure all three parties are happy in the end and that you have a killer project to show off in your portfolio. Want to learn more about the process of collaborating with a developer? Check out my free series, Get Back To Design, which has all the details about things to know before your first collaboration, what the process looks like, and how to find the perfect developer for you. 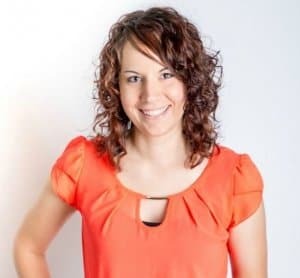 Krista is a WordPress developer who specializes in collaborating with passionate designers to craft strategic websites that directly support their clients’ goals, while helping them ditch the tech and spend more time doing design. Through WordPress development and website strategy consulting, she’ll help you create websites your clients will love for years to come. Learn more over on her website!